"Leave it to Beamer" is a children's book series about a young boy, Beamer, who dreams up wild, imaginative ideas for where he believes English idioms and other figures of speech may have come from! And in the end, Beamer also learns the TRUE meanings of these silly sayings! The series is humorous, adventurous and educational all at the same time! In Don't Let the Cat Out of the Bag, Beamer imagines a kingdom of mice who have to fight off the evil cat Meowzer and stop him from taking over their kingdom. And in the end, Beamer learns the TRUE meaning of this silly saying! OR, scroll to the bottom of the page for a list of local stores that carry my Leave it to Beamer books! 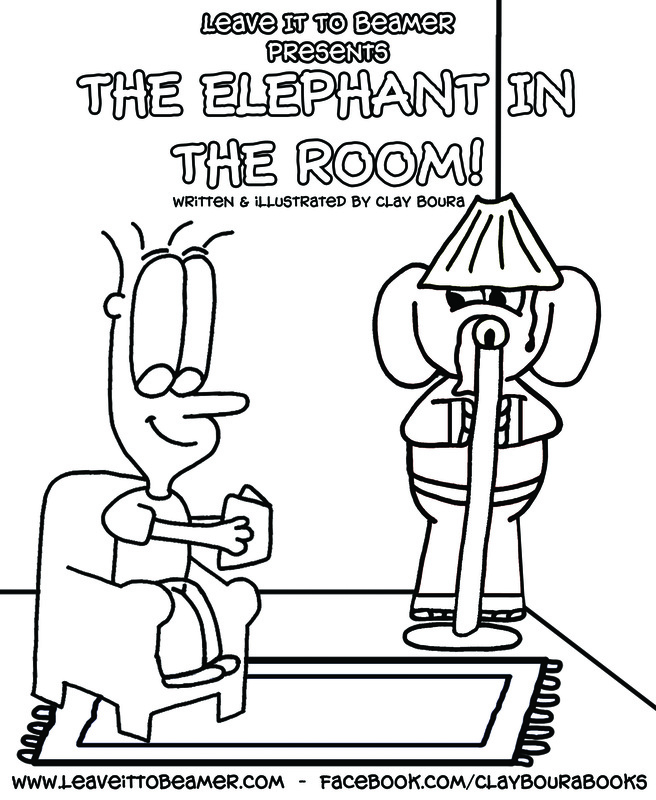 In The Elephant in the Room, Beamer imagines a land of hippo's who have been overrun by an evil gang of rhinos. And in an effort to rid their town of the rotten rhinos, the mayor calls for help from the elusive elephant ninjas. And in the end, Beamer learns the TRUE meaning of this silly saying! In The Proof is in the Pudding, Beamer imagines a mystery that takes place in the City of Custard. The town's favorite pudding factory starts losing business to an upstart gelatin store and so the mayor hires investigators to solve the case. And in the end, Beamer learns the TRUE meaning to this silly saying! 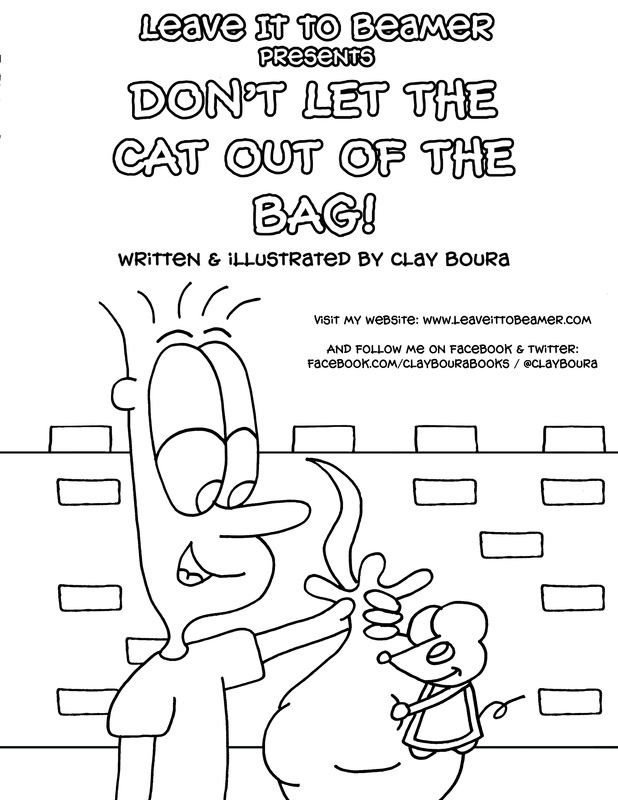 Leave it to Beamer Presents: Fun With Idioms is a 24 page coloring and activity book. Inside you will find a mixture of coloring pages, mazes, word searches, "Draw the Idiom" pages (where you are given an idiom and a space to draw your own interpretation of that idiom) and "Decode the Idiom" pages (where you are given an idiom to decode using a letter & numbering system) all based on the idioms and the characters from my Leave it to Beamer children's book series. In addition to purchasing online through my website HERE, the Leave it to Beamer books are also available from the following retailers. If you're planning a trip to "Michigan's Little Bavaria", aka Frankenmuth, MI, be sure to stop in at the Amazin' Mitten store on Main Street. You can get all of the latest Leave it to Beamer books and t-shirts while you're there! Look for the Leave it to Beamer books online through BAM!, also known as Books-a-million. Check them out HERE. ​And just like with Barnes & Noble, I am currently trying to get my books into their physical stores! Details to follow! The Leave it to Beamer series is available at the Barnes & Noble store located on Rochester Road in Rochester Hills, MI and I am currently working on getting my books into other local Barnes & Noble stores as well. The books are also available through the Barnes & Noble website HERE. The Leave it to Beamer series can be purchased at a wonderful book store called Fenton's Open Book which is located in Fenton, MI. Fenton's Open Book is a full-service, independently owned book store which carries many titles from local Michigan authors. The Leave it to Beamer series is available through Storybook Village of Pentwater, one of the "Top 14 Best Ever Children's Bookstores in the United States"! Storybook Village is so much more than a bookstore.....it's an imagination destination and I am so pleased to have my books in their store! This wouldn't be possible without the help of my AMAZING publisher, Mascot Books. And you can purchase the Leave it to Beamer books directly from their website HERE. Surprise, right?! The Leave it to Beamer books are also available online through Amazon.com, the 900 lb gorilla. OH! HEY! There's an idiom for another book! Check it out HERE. My Leave it to Beamer t-shirts are also available on Amazon.com, which can be found HERE. I have a shop on Ebay where I sell my Leave it to Beamer books, my coloring/activity book and my Leave it to Beamer t-shirts. My shop name is "AuthorClayBoura" and can be found HERE. I also have a shop on Etsy where I sell my Leave it to Beamer books, my coloring/activity book and my Leave it to Beamer t-shirts. AbeBooks is an online marketplace where you can find millions of new books, used books and rare or hard to find books. ​AbeBooks is also another place where you can find the Leave it to Beamer book series, which can be found HERE. My Leave it to Beamer books are available through Book Depository, the world's largest specialist online bookstore and the fastest bookseller in Europe. My books can both be purchased through BookDepository.com HERE. If you happen to be in the outback and are looking for some good reading material, you can find the Leave it to Beamer books on BoomerangBooks.com, Australia's Online Bookstore! Check it out HERE. As my books become available through additional sources, I will continue to update this listing. Or, if you find my books from other sources and would like to notify me, please feel free to use my CONTACT page and let me know! I would love to hear about it!